(Long Beach, California) – The Long Beach Expo (www.LongBeachExpo.com) closes out its trade show year with more giveaways, special exhibits and contests at the upcoming Long Beach Coin, Currency and Collectible Expo, September 8-10. "This is our last trade show of the year, and we'd like to finish strong," said Long Beach Expo President Cassi East. "We're giving away a special 2016-W $25 American Gold Eagle coin daily, PCGS is featuring exclusive giveaways and their Crossover Special as part of their 30th anniversary, award winning sets from the PCGS Set Registry will be on display, and of course we're getting the kids involved with our Treasure Hunt." The official auctioneer of the Long Beach Expo, Heritage Auctions (www.HA.com), will conduct their Signature U.S. and World Coin auctions and U.S. and World Currency auctions. With 25 or more submissions, Long Beach Expo attendees can earn a free PCGS 30th Anniversary Medal. PCGS continues its celebration of 30 years of coin grading by offering their show exclusive, on-site Crossover Special. PCGS Collectors Club Members and Authorized Dealers can submit their crossover coins, and for those that do not successfully crossover to PCGS, only a $10 fee per coin will be assessed. Normal Grading, and Guarantee Premium fees apply to coins that do successfully crossover into PCGS holders. "We're very happy to provide collectors and dealers alike with this exclusive offer. We're allowing a maximum of 600 crossovers per customer and accepting holdered coins from ANACS, ICG or NGC," said PCGS President Don Willis. PCGS is also giving away their exclusive 30th anniversary medal to those who submit 25 or more coins. Those who submit one or more coins can also take home the popular PCGS 30th anniversary hat. 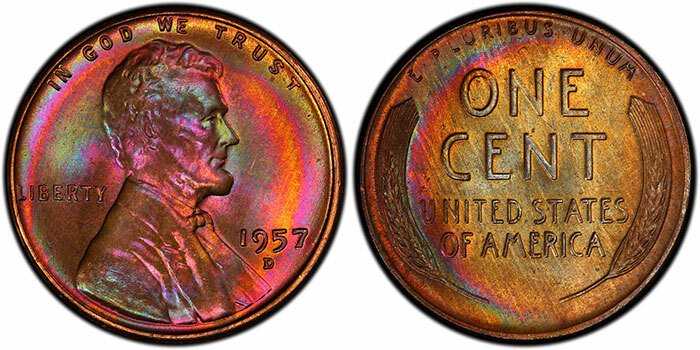 This set of rainbow-like Lincoln Cents will be on display at the Long Beach Expo. The Collectibles Display booth will feature two award-winning sets from the PCGS Set Registry: the "Fireball Rainbow" Lincoln collection and the Legend Collection of Liberty Seated Dollars. "Both of these acclaimed sets are visually stunning and truly unique," said East. "The 'Fireball Lincoln' collection is a vibrant display of naturally-toned Lincoln Cents that recently won the Best Digital Album of 2016 honors for the PCGS Set Registry." "The other set on display, the Legend Collection of Liberty Seated Dollars, is a pedigreed set that contains various coins that are the finest example known, and is a Set Registry Hall of Fame collection since 2004." Budding numismatists can try their hand at coin grading during show hours with PCGS’ grading competition, for both adults and young numismatists. The competition will be held in 30-minute slots during show hours, from September 8-10. Sign up for the contest by calling PCGS Customer Service at (800) 447-8848. Each day of the Long Beach Expo will feature a random drawing in which the winner will receive a 1/2 ounce 2016-W American Gold Eagle coin. Children in attendance can participate in the Treasure Hunt, which takes place Saturday September 10, from 11 a.m. to 2 p.m., and earn free PCGS-graded coins. The Long Beach Expo will feature expertise from overseas, as several notable coin dealers from China will be in attendance and conducting “Meet the Expert” sessions daily. Thursday and Friday “Meet the Expert” sessions will take place from 3 p.m. to 5 p.m., and the Saturday session is from 10 a.m. to 12 p.m.
Professional Sports Authenticator (www.PSAcard.com) and PSA/DNA will be in attendance and accepting submissions at booth 1542. The Long Beach Coin, Currency and Collectible Expo takes place Thursday, September 8, through Saturday, September 10. Show hours are 10 a.m. to 7 p.m. from Thursday to Friday, and 10 a.m. to 5 p.m. on Saturday. The Long Beach Expo will take place at the Long Beach Convention Center, located at 100 South Pine Ave, Long Beach, CA. "Getting free passes to the Long Beach Expo is simple. Just visit www.LongBeachExpo.com, select 'Get Passes,' and enter the promo code: EXPOPR," said East.